EISBRECHER - Beatcon Festival in Finland 2015 confirmed! Eisbrecher are confirmed as headliner of the Beatcon Festival 2015. The event takes place from 29. - 31. January 2015 in the Finnish Jyväskylä @ Paviljonka. Eisbrecher will headline the festival on 29. January 2015. 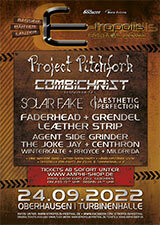 ZERAPHINE - Open Air Show 2012 confirmed! ZERAPHINE are joining Eisbrecher and Schöngeist at Wasserschloß Klaffenbach (near Chemnitz) for the upcoming Klaffenbach Open Air Festival on 24.08.2012. WELLE:ERDBALL - Live in Glauchau! A new WELLE:ERDBALL show at Alte Spinnerei in Glauchau, Germany has been confirmed for 06.10.2012. WELLE:ERDBALL – Mera Luna Festival 2012 confirmed! Good news for WELLE:ERDBALL fans. The band has been confirmed to play at this years Mera Luna Festival (11.-12.08.2012) in Hildesheim. EISBRECHER + SCHÖNGEIST – Confirmed for Klaffenbach Open Air! EISBRECHER & SCHÖNGEIST are confirmed for this years Klaffenbach Open Air Festival at “Wasserschloß Klaffenbach” (near Chemnitz) on 24.08.2012. EISBRECHER – Mera Luna Festival and Deichbrand Festival confirmed! EISBRECHER are confirmed for the Mera Luna Festival (11.-12.08.2012) in Hildesheim, Germany and also for the Deichbrand Festival (20.-22.07.2012) in Cuxhaven, Germany. Eisbrecher - "Verrückt" videopremiere on facebook! Clear the ropes and full speed ahead! We are very glad to welcome the band ZERAPHINE as the most recent entry to our artist roster! ZERAPHINE and STAUBKIND have both been confirmed for the upcoming edition of the Zita Rock Festival on 16th June 2012 at the Citadel Spandau in Berlin. The line-up also features ASP, Saltatio Mortis and Mono Inc.! 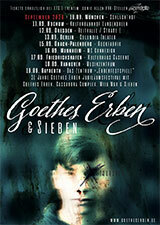 In 2012 WELLE:ERDBALL will continue with additional shows to their “Der Kalte Krieg (The Cold War)” tour. Also they have been confirmed as special guests on And One´s “Cover for the masses” tour in Spring 2012. For all dates please check our “tourdates” section! Covenant and Project Pitchfork have been confirmed for Rewind Festival at Vooruit in Gent/Belgium. Whereas Project Pitchfork are scheduled for 6th April, Covenant are to play on 7th April 2012. 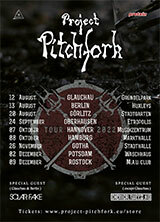 After the recently finishing their successful “Sextron” tour, AND ONE are returing to the stage in April/May 2012 with the brand new “Cover for the masses” tour all over Germany. Pre-selling has already begun. 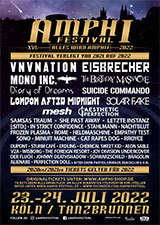 AND ONE, 18 SUMMERS and SCHÖNGEIST are confirmed for the Amphi Festival 2012 on 21./22. July at “Tanzbrunnen” Cologne! Eisbrecher summit concert sold out! The exclusive Eisbrecher summit concert at the Zugspitze is sold out! Initially planned to stay open until 20th October, ticket pre-selling had to be closed today, as the last tickets have been sold! Even more we rejoice with everyone, who was able to catch one of the strictly limited tickets, to rock the EISZEIT tour finale on 5th November 2011 at the sold out Zugspitze! EISBRECHER SUMMIT-SHOW – Few tickets available until 20th October! Only 72 hours! – Ticket selling for the exclusive EISBRECHER summit concert at the Zugspitze will be closed shortly. Tickets can be purchased until 20th October 2011. Yet there´s twice the need to hurry, since there are only few tickets remaining for the almost sold-out show at the Zugspitze. Don´t miss this last opportunity, Become a part of this very special event and secure your ticket immediately online at www.protain-ticket.de - while stock lasts. There will be no local box-office to buy tickets at the venue!! New artists have joined Protain! Over the course of the past days and week a couple of new artists joined the protain roster. Thus we look forward to the cooperation with 18 SUMMERS, SCHÖNGEIST, MONO INC. (territories outside G/A/S) and last but not least AND ONE, for whom we currently manage the ongoing Sextron Tour. On 31.10 Faderhead embark on a trip to Spain, playing at the "Nocturna Festival" in Barcelona. Further they are confirmed for the Man & Machine Festival in Den Bosch - The Netherlands on 10.12.2011. 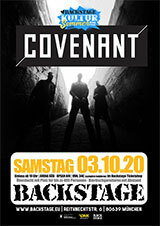 Covenant are coming to Helsinki / Finnland, playing a headliner show at the Alternative Party 2011 on 21st October. The first set of DJ-dates for Wolfgang Flür (Ex-Kraftwerk) are confirmed. His journey leads to Venice, Stockholm, Kiev and Pisa (see our tourdates section).